Humour me. Allow me one last moment of politics. Just one last moment, before we all roll up our sleeves and volunteer for the coalition's Big Society. It's all in the national interest. David Cameron has promised to govern Scotland with "respect" and will travel north of Hadrian's Wall within the week, carrying a whopping, Calman sized gift. Might I be so presumptious as to suggest a destination? As a keen football fan (he's a Villain!) 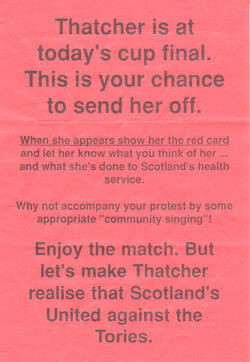 Mr Cameron will know that this weekend sees Ross County and Dundee United contest the Active Nation Scottish Cup Final. What better way to bring his message of hope to the people of Scotland? A nation, at this stage, still to share in the Cameroonian love. And there's a precedent that would go down well in the Tory heartlands. He'd be making a pilgrimage in the footsteps of dear old Margaret. She handed over the trophy to Celtic captain Roy Aitken in 1988. I'm sure David would love to unite both sets of supporters at the national stadium just as Mrs Thatcher did 22 years ago. re: 1988 final. Margaret Thatcher and Anton Rogan in the same place, at the same time; the politician I hate the most and the footballer I hate the most. Talk about an opportunity wasted as she handed his medal to him. Oh, for a grassy knoll at Hampden.